I am sitting here simply remembering and basking softly in the afterglow of a few days of incredible experiences. It is difficult to remember all the nuances and learning furiously crowded into a few days at a pace far faster than my everyday, but I am willing to make the attempt if you are willing to sit back and vicariously experience with me once more. On the way to the airport, my sister’s husband had brought a bottle of Martinelli and four glasses to wish us a ‘bon voyage’ how incredibly thoughtful was that? Especially since he was dying to go himself. Anyway, we arrived on time at the airport. I’ll spare the most mundane details, but the choral society had everything well in control> Jim and the travel agent were true to their words to take marvelous care of us. We received our tickets and were off in no time. It still takes my breath away, when I see an armed guard at the security point. Some things change life forever. I’ve learned to take off my shoes and it paid off, nary a beep the whole trip. My sister however wasn’t as lucky, she refused to take off her shoes on the way home and got wanded. The flight was nice, the airlines announced their ‘celebrities’ on every leg of the trip. We enjoyed ‘Maid in Manhattan’ on the flight there. Ironic perfection. It was cute and sweet, and a bit of a primer in what we would be soon in the midst of. Thursday seems so long ago now, goodness. We arrived safely at around 3:00 after losing our three hour difference into the odd world of time-keeping. A few of our party (we traveled on different flights) were stranded in Chicago overnight, but our flight was flawless. We checked into the Grand Hyatt, and were awed by the marble waterfalls and rich woods. Our room was tiny, but had a marvelous view off the 28th floor of Grand Central Station and the Chrysler building. What a magnificent piece of architecture. Anyway, Neil Diamond’s “Beautiful Noise” came to mind as the rush of the city cradled us almost instantly. We unpacked and set out to explore. Our first stop was GCS. I’m still not certain if that was a mistake or a blessing. We figured out the METRO machine, and purchased tickets (that we ended up only using once). We were a trio on a mission. It was now 6 our time and we had only eaten the lovely snack packs from the bankrupt United Airlines offerings. We wanted a real Jewish Deli sandwich. Two wonderful NYPD assisted us with recommendations (after arguing about it for a moment or two) and we chose the closest place. PAX deli. Which we learned was actually a chain, but it was good and definitely did the job. The soup was incredible. (Oh dear, this is going to be long, I can tell already. . . ) Anyway, from that point, we walked through Bryant park and it started to sprinkle. The forecast was for rain all weekend. (We never did get any, probably because I carried an umbrella all over with me). We purchased maps and set out to conquer the city. It was a delicious adventure. We found people and parks and walked in the wrong direction many times. Still, our first day was filled with laughter and acclimation. When we finally got on the subway, it was sardine time. Rush hour I guess. I was slightly apart from our protector and my sister was on his left. There stepped a man between us. I was more worried about my purse than my purity at that point, but I suddenly realized that the man next to me was pushing VERY hard against my thigh. I looked for an umbrella, but he had none. I felt the pit of my stomach lurch, but tried to be calm and logic that it was very crowded and he probably couldn’t help his reaction. Well. . . he was evidently enjoying the ahem. . . closeness. . . more than I was comfortable with. He kept pressing harder, until finally I put my hand on my hip and shoved my elbow into his midsection to hopefully allow some distance between his . . . um. . . enjoyment and my person. This only served to make him bolder. By this time I realized that it was no accident, just as his hand began doing some additional exploring. Ugh. . . it makes me ill folks, I’m a fairly modest woman. Anyway. . . I finally urged my sister and friend that we WERE getting off at the next stop, and pulled them both out, the man reached for my arm to pull me back, but I managed to free myself and get out the door. We exited and to my chagrin, my sister burst out with ‘Thank you! That man was groping me!” Ack! One thing for me, but my little sister? Ok, I was annoyed and felt rather ill frankly. There just doesn’t seem to be a lot of myth to the brazenness of NYers. Our male companion of course was mortified that he hadn’t been aware, and apologized many times. It did however serve to make him much more protective about his ‘pair of redheads’ from that time on out. That was my worst experience. We quickly forgave New York however when we stepped onto Times Square and thoroughly enjoyed the spirit and diversity of the unique people. Street vendors, lights, cabby’s, NYPD, and folks from every conceivable economic and racial background converged into a living breathing example of humanity. I loved every moment. We must have walked 400 miles in our days on the pavement, since neither my sister nor I cared to venture back underground this trip. So. . . we walked. We covered every street between 30th and 60th I think, in every direction. My feet felt like they were going to literally fall off. (This is already long, and I’m only on Thursday!) Anyway. . . we returned home around midnight after a full day of discovery. Friday morning we picked up our pre-ordered bagels and cream cheese from Bloom’s deli and boarded the bus for a four hour site-seeing tour of the Island. Our guide was a delightful native ‘Born and bread in Broowklyn’. She took us to ground zero and St. Pauls church, where we held our breath at the remaining expressions of resilience and devotion of the American people. We walked through the amazing Central Park, and danced in “Strawberry Fields” after seeing where Lennon was shot, and the view from Ono’s apartment. (which we were told, that 200,000 wouldn’t buy a doorknob in). The “Imagine” memorial was accented by fresh flowers from fans. The fountain and the history of the place definitely expressed as our guide said, “the lungs of the city”. It was a bastion in the center of concrete. Gracious, there is so much I’m leaving out, even with this novel. It reminds me of the series ’24 hours’. . . where indeed so much can happen simultaneously in a moment. My sister was mesmerized, and loved the street vendors, stopping to have her daughters name in painted letters, her own portrait in charcoal, watercolors of Yankee Stadium and spray paint artists doing the skyline. Everything fascinated her and her checkbook was ready and quick. It was delightful to watch. (I’m not a big spender.) We ate roasted nuts from little carts on the corner, and fresh pretzels from the same. We listened to steel drums and Indian flutes in Times Square. Every day had its own agenda and personality. We had time to scoot up to the Empire State building, and listen to “Tony – ex cabby” give the facts and fiction about where and when. He was delightful on a tape recorded tour of the city from up high. It was freezing however, and we left my sister outside to brave the wind while we looked from inside the gift shop. We flirted with the elevator guys, and just spread California sunshine wherever we could. The world truly does look different from the heights. It seems to matter so much less, the little difficulties and dramas of our lives. Friday night we had tickets to see Phantom of the Opera. We searched out a pizza place first and came up with Bravo’s pizza, where I lost my black gloves. (Pout) it was the coldest of the days. The music was incredible, and the staging perfection. The costumes weren’t as good as the ones in SF however in my opinion. I sat and felt the angst of millions of people who have been dished out difficulties to overcome far beyond anything within my ken, and was grateful for being spared. I listened to an expression of a wish that I think we all can relate to intimately, ‘Just love me’. I felt a unified sigh of a people connected by music and emotion, and smiled at the talents and efforts of hundreds that made the evening possible. During intermission, I called my messages. There was one from my daughter who was at home, and one from my daughter in Cleveland telling me to call my mother’s cell phone. The hair on the back of my neck stood up. I called. “Um. . . well. . . you don’t need to come home, but Kevin is in the hospital, a table fell on him, his shoulder is broken” I gasped, loudly I think. Someone nearby said, “Is there another phantom?” I got the details until the curtain was about to rise again. Now my hope of an uneventful few days at home was definitely shattered. Saturday morning was spent in rehearsal with lots MORE adventures to tell, as we stepped into the belly of a church to see how we sounded a continent away and with 60 less singers. The ‘organizer’ was . . . well, my friend called him the ‘Carnegie Gestapo’ if that helps. He treated us a bit like cattle to be honest. It was his job to simply move people, and though he did that part well, I think he forgot that we were people at times. . . I’m not fond of a patronizing smile, I don’t care who you have met or rubbed elbows with in the past. Anyway, he wanted to rearrange us all to fit his set-up. He simply didn’t ‘get’ that we are arranged by voice type and that our conductor spends HOURS deciding who is by whom, and what voices blend best together. The look on our conductor’s face was ashen as ‘John’ said, ‘why don’t you just move here and here and here. . .” finally Don (our conductor) stepped up and just said, “Look, I’ll do all this on paper and they will be exactly as you need them tomorrow.” He is incredible. His patience and calm did wonders to make us all feel confidant. My friend had his son and daughter in law join us for lunch at the most fabulous pizza place in NY. John’s Pizza. The wait was long, but well worth it. MMmmmmmm, nothing like it. The remainder of the day was ours again, and we set off to the garment district. My sister loved to shop, and shop we did. Gracious. At the end of the trip we were looking at the ‘skymall’ and they had a beeper you could attach to lost items. My friend said, “we needed that for Loralyn!” It seemed that we all too often turned around and Saks Fifth Avenue or Harry London’s had swallowed her up. She was a kid in a candy store, and NY was thrilled to have her there. We went in antique shops, jewelry shops, clothing shops, kitsch shops, sequins and shoes and everything in between. We teased her unmercifully, and she was an angel about it. It really didn't bother us. David and Robb met us for dinner after their matinee. We were going to Le Mela, the best Italian restaurant I’ve ever eaten in. We flagged down a cabby, with all the personality and color that NY promises. He weaved in and out effortlessly, informing us that ‘I drive with two feet, I don’t want to waste a second!’ and he didn’t. During stop lights, he picked up his one string Indian ‘banjo’ and played for us. He was a complete delight. Our dinner was extraordinary, as have been the previous two I’ve enjoyed there. It is like being invited into a huge Italian family’s home for dinner. The owner is always bubbly and smiling, and shouting and teasing, bustling around like a mother hen. He tells you, ‘No, not Mozerella. . . with a O. O. Mooooozerelllllla!’ He insisted on taking our pictures and grinned mightily when we teased and complimented. It is family style, six courses, with no menus. Whatever they are cooking that day is what you eat. (Though I think there ARE menus if you insist) and everyone eats from one platter. Heavenly tortellini yegads, I can still taste it… Everyone was greatly impressed and the ahem. . . triple figure bill was decided well worthy of the experience. AIDA was next, and oh my goodness I adored the show. Though I’ve seen it once before, the first time I remember thinking the moment the curtain fell, “I want to see it again!” The music is stunning, and of course the story is heart wrenching. Though it wasn’t a ‘happy’ ending, it was deeply satisfying. I learned much, all of what I won’t or perhaps can’t take the time to tell here, this being already the fifth page of my synopsis. Still, I felt the truth embedded even deeper, that we are not what we do, or what happens to us, but quite simply who we decided to be. We went to Hooligans (Hoolihans?) for French fries and the most incredible Ice Cream pie I’ve ever tasted. Caramel, fudge dripped over Oreo cookie ice-cream with a peanut butter crust. We weren’t about to miss a single experience we could nudge into our time there. Though it was busy, it was good busy, and we spent lots of time people watching, getting lost, exploring niches and talking. The other chorus members (270 of us in all) were bumped into wherever we went, which was also a delight. Busses picked us up to rehearse in Carnegie bright and early Sunday morning. We were all given our ‘fort knox’ back stage passes, and the instruction to relish and remember. We did. The orchestra was young, but fairly good. (Ours in Sac is better. . . INHO). The tenor was good, the soprano good, but not as good as ours. . . and the Baritone was, ahem. . . a liability. (He even forgot a whole chorus during the performance!) The children from Rutter's Requiem were from Texas and MI, and wours were from NJ and the city. They were wonderful and as awed as we. I could hear the spirits of so many converge as the music lifted and seeped into the very woodwork and gilding of this astonishing place. It is the number ONE acoustically superior place in the world. You could hear yourself blink nearly. We worked out the bumps and then were off to enjoy the rest of the day until getting on the busses again at 7:30 for the performance. We walked across the street (and took even MORE photos of course) to the Carnegie Deli. It was incredible. Walls and walls of celebrities lined the hall. The cheesecake was six inches high, the sandwiches were literally piled 9 inches tall with meat. We shared pastrami on pumpernickel, and it was an additional $3.00 sharing fee. Three pieces of cheesecake and a sandwich came to $40. We thought it was pricey, but the experience was fun. 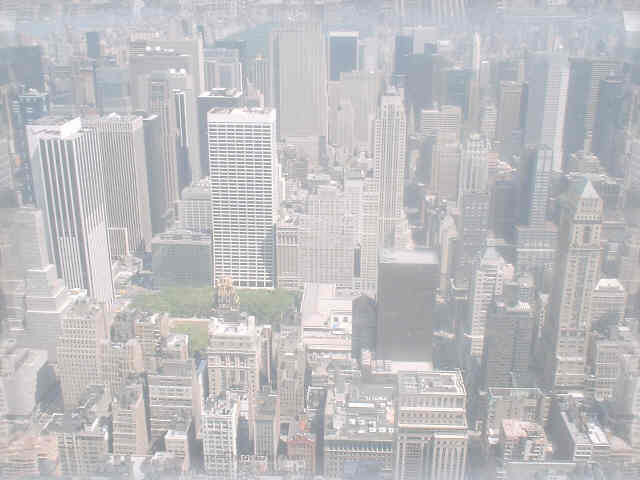 We then meandered over to Rockefeller Center and the Met. Both the square and the museum were beautiful and busy. We talked to NYPD and enjoyed quips with newsboys. My friend is not shy, and has a marvelous sense of humor, everyone that meets him leaves smiling. It was a pleasure to just interact with those around us. I was looking at some Tiffany reproductions in the Met gift shop, and said to no one in particular, “Oh, how pretty”. This man said, “thank you.” I laughed and asked if he didn’t prefer handsome. He retorted with, ‘not at all, a pretty woman delighted is perfect.” I think I actually blushed. Another friend flew in around 3:00 from Main to see the concert, so we caught up with him and then went to lunch back to Hooligans. (Hoolihans?) Delicious potato cheese soup. MMmmmm. Now it was time to get rested, and dressed for the concert. I was faster than my sister, and went to spend some time with my friend before it was time to go. That was delightful. He is on his way to the Dominican Republic on a service week to assist with a hospital he is affiliated with there. His stories made me want to go myself, and take my kids along. The people and the caring really sunk deeply. The high notes were bell-like and the men were one voice. There was almost a train wreck when the orchestra didn’t come in for the Soph’s entrance, but after the second cue, she just started without them, and it went on delightfully from there. At one point, I closed my eyes, and just drank in the ambiance. It really is a moment that will stay with me all my life. I am so grateful for all who made it possible. We then all were loaded onto the buses for a cruise on the Hudson. I was able to get tickets for my friend as well, and we all four had a magnificent time eating dinner, dancing and best of all, going to the top of the boat and looking out under the stars as we came up to the Great Lady. From down below, we could hear our chorus singing, “God Bless America” and I stood flanked with friends from both coasts, (Blue sparkles are stunning, but freezing!) dazzled by the beauty and significance of the freedom that is ours here. It made me smile. My sister turned around and she too was teary-eyed. The hush was wonderful as many of us stood and just experienced the deep gratitude of being where we were washed over us. From then on, it was a winding down and deep breaths. We were too wired to sleep of course, and after singing every song any of us could remember on the bus ride home, some of us went up to our room and sang some more. Finally after sending everyone home and packing, we fell into bed around 4 am. My sister and I had breakfast duty, so we were up and at’em at 7:30. We had a few hours to get breakfast, slip over to the bus depot to send off my friend and then watch people for the little bit of time we had left. We went into one last store, and I actually purchased myself a beautiful shawl. Oh my, and if that missive didn't put you to sleep? Remember that I didn't tell you about the adorable hang out of the stars, Barrymores, where there is "Congratulations Tony Nominee's" Chalked on the wall. It was rather lovely actually dining with two of the nominees. They named dropped only after nudging. So, I touched the hand that touched the hand that touched the hand. . .
Or the fabulous street artist who insisted my sister was "Fergie" and wouldn't believe we didn't arrive by helicopter. Facts like, "Don't Walk" is merely a suggestion, and only in NY will you find a sign saying "NO STANDING". Perhaps I ought to tell about pretending I was at what is it, Gorman's? Chineese Theatre? Where I stepped in a fresh square of cement and covered my boot. It was a riot standing on the street corner at 1 am with three men trying to wash off my boot before it dried. The trip home was uneventful, the movie, “The Recruit” was great. We arrived home ahead of schedule and everyone that I knew of (even the lady who fainted, the man with food poisoning and the two pregnant women) returned safe and sound. The millions of sights and sounds of the place are too difficult to adequately express but in this retelling, perhaps just a tiny flavor has seeped into the words and offered the tiniest bit of joy that we relished. My family is well, my home is still standing, the spammers had a hey-day (1267) and you all missed me. It was a delightful trip. 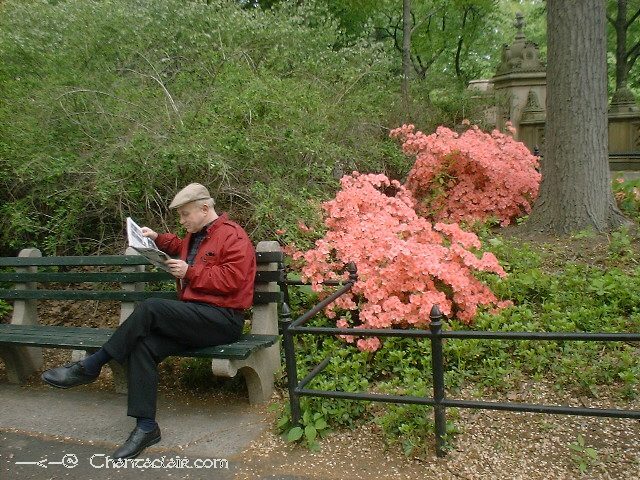 A gentleman enjoying Central Park. "The Lungs of the City"